Great photo shoot this week with Chris Hornbecker. He shot some more portraits for IDRI. It's a great atmosphere shooting with him and his assistant, Caleb. They were playing '80s music off Caleb's ipod, and the people we were photographing were loving it, and that got us talking about how awesome the '80s were, so wrong and awesome, and just cracking up about how amazing the music and fashion and politics and style and philosophies were. 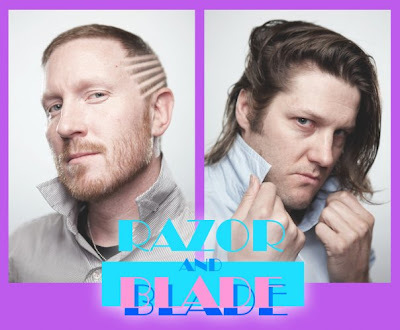 So while I was gone during the lunchbreak, Chris and Caleb took these shots of each other as "RAZOR and BLADE: This electro-pop duo/time traveling crime fighting team travel back to the '80s to fight crime and end Reaganomics."